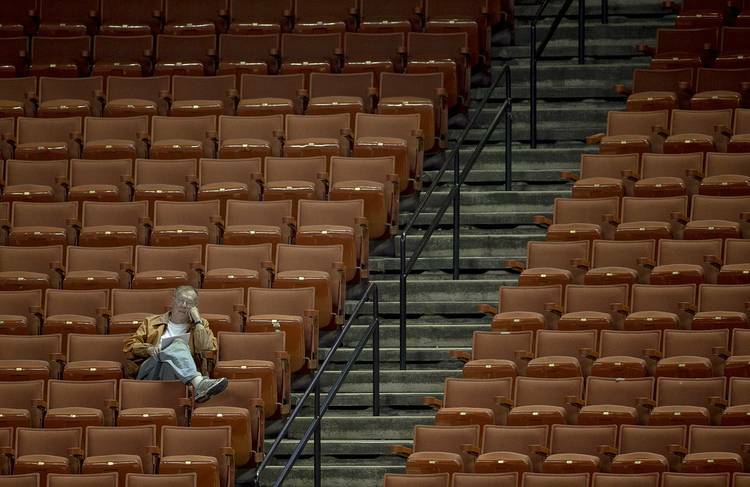 After a .500 season and NCAA Tournament snub, have the Longhorns' fans checked out? So if only 1,739 people showed up to the Erwin Center to witness Texas win an NIT game, did it really happen? Allow me to answer in the affirmative with one addendum: The fans have checked out. To steal a line from Air Supply, they’re all out of love. That’s right, the local college basketball team and embattled head coach Shaka Smart got it done and moved on in the NIT as its fan base turned a mostly blind eye to the proceedings. The Erwin Center’s public address announcer set the right tone before Tuesday night’s tipoff before a Club Erwin crowd that was a few dozen butts north of 10 percent capacity. Yep, NIT basketball, five decades past its prime. It’s also the Texas program in its current state, scrapping past a team from near Canada in a near-empty house. A few did show up to watch the Horns take a 19-0 lead, give it back, then win thanks in large part to senior forward Dylan Osetkowski, who scored 26 points in his best game ever. On the bright side, the Horns are two wins from playing in the NIT semifinals at Madison Square Garden. But to be honest, any success the team experiences in the next two weeks is being viewed through a blurry lens of apathy from most of its fans. That 19-point run to start the game came with a bit of irony. The Horns couldn’t miss, which is sad to say given the fact they missed out on being included in that, um, other tournament. That said, there’s plenty of hoops remaining to be played and at least 1,739 people still care. Shoutout to those fans who did show up to support. As for the ones who decided $14 was too steep a price to watch this team live … I’m not saying you should have stayed away, but I understand. “We can’t control other things that aren’t under our power,” Smart said. I get his point, but technically he can control the amount of people who show by winning more games. It didn’t escape the assembled media that Smart, now 67-66 in his Texas tenure, was speaking in front of a massive NIT backdrop. Nice marketing for the tourney, but probably not a pic that will make the Smart family photo album. This extended season — I hesitate to call it the postseason because it isn’t the NCAAs — hasn’t been anywhere close to the debacle that was the 11-22 finish in Shaka’s second year, but it came with a torturous hope-killing dynamic filled with shouldas, wouldas and couldas. As for the head coach, he is finally starting to verbalize the obvious: He is fighting to prove himself as the right guy for this job amid a struggle that has resulted in zero NCAA Tournament wins in his first four seasons. If anything, that win created more practices, which is beneficial, particularly for young cats like freshman guard Courtney Ramey, a future star playing in his first postseason. The real Madness begins Thursday, but the Longhorns are out to show their disheartened followers that a couple of NIT wins will mean something in the grand scheme of things. 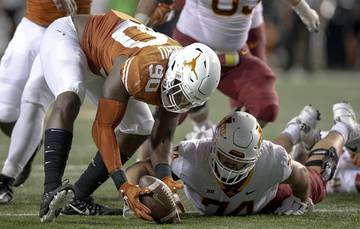 Texas will probably be home for another game and if that happens, don’t be shocked to see more fans show.